Cover art for The Calling: 20th Century Women Artists is painting by Emily Carr. Back cover photo of Judy Wells (below) by Marjorie Young﻿. and lie down on the earth. and my broken body unfolds its pain. growing within me, thick as my wrists. 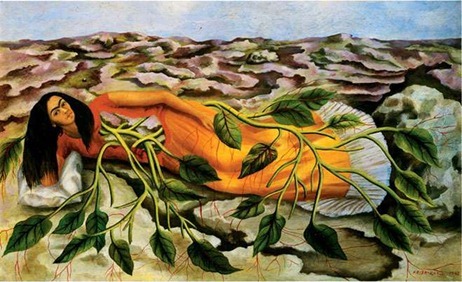 Frida Kahlo, "Self-Portrait with Braid," 1941.
done up like a bread basket. until my scalp tingles with pain. 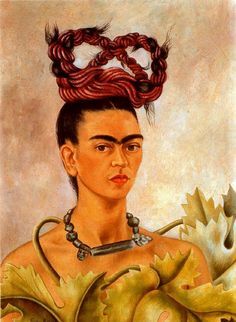 what is Frida doing with her hair today? Once I shaved off my moustache. I grew it back so it was soft and black. I have braided red ribbons in my hair. and insects have gathered in my hair. and have only saddened myself. It can plait itself through a fence. Weave its way up walls. while I sing myself to sleep. and Self-Portrait with Cropped Hair, 1940. Emily Carr, "Big Raven," 1931.
with two great totem eagles. that would eat her alive! She hears a flapping within.